Submitted by mahoney on Sat, 08/11/2007 - 6:38pm. 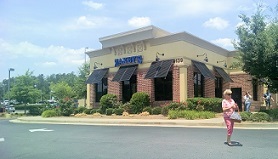 I have put together all known Zaxby's restaurants with info from their website. Originally submitted by Mikeyg75. Maintained by wknight40 from 7/12/2011. Maintained by mahoney from 1/7/2013. Updated the file. Net increase of 12 locations. Updated the file. Net increase of 13 locations. Updated the file. Net increase of 15 locations. Updated the file. Net increase of 25 locations. Added 12 new locations to the file. Updated the file. Net increase of 36 locations. Updated the file. Net increase of 48 locations. dded new locatios Fountain Inn,SC,Durham,NC,Elizabeth,NC,Charlotte,NC,Ringgols,GA,Deland,FL. Corrected the coord for the locations in Lawrenceville,Ga. Added new locations in Tulsa,OK, Hinesville,GA and Danville,VA. Added 8 new locations.GA-2, IN-1, LA-1, NC-2 and UT-2. Updated the file. Net increase of 12 locations including 5 opening soon locations. Updated the file. Net increase of 34 locations. Added 4 new locations: Columbia,MO (2), Washington,NC and Wilmington,NC. Updated the file. Net increase of 8 locations. Added new locations in Crawfordville,FL and Holly Springs,GA. Updated the file and added 15 new locations. AL 4, FL 1, GA 3, KY 1, LA 1, NC 2, TN 2 and VA 1. Corrected the coordinates for the location in Marion,AR. Submitted corrected coordinates for the locations in Blairsville,Ga, Blue Ridge,Ga and Hiawassee,Ga. Updated the file. Net increase of 6 locations.